If you read any tech blogs than you are most likely aware that John McAfee the multi millionaire behind the McAfee security suite is “on the lam” in Belize. He’s wanted for questioning in the murder of his neighbor in Belize, 52 year old American businessman Gregory Faull. The Belize government has said repeatedly that they only want to talk to McAfee. It seems that there was a dispute between McAfee and Faull over McAgee’s dogs who ended up getting poisoned. This all happened before Faull himself was found dead. McAfee has turned into some kind of rogue underground hero. He’s been blogging and tweeting, while trying to avoid “capture” by the Belize police. He’s told anyone who will listen that he is afraid he would be killed if he was captured by the authorities. His mental state has been in question all the while. In one interview, with a journalist who’s been favorable to McAfee for quite some time, McAfee played Russian roulette while the interview was being conducted. 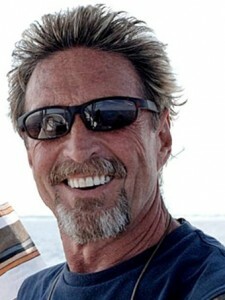 There have also been wide internet reports that McAfee enjoyed experimenting with “bath salts” for recreational use. Since this crazy fiasco began McAfee has been keeping people up to date on Twitter and on his personal blog, whoismcafee.com. As we headed into the weekend McAfee went radio silent and his back up blogger went to work setting the plan in motion in case McAfee had been captured. McAfee penned a blog entry a short time ago indicating that he was still in hiding with friends and he was safe but “not quite out of the woods yet”. He’s in the company of Vice Magazine. McAfee reports that he is getting his companion Sam safe, and after she is safe he will return to Belize because he can’t keep up this fight in “exile”. Yes, your computers are being protected with software developed by this man.